Leaking plumbing, want to DIY... guidance? 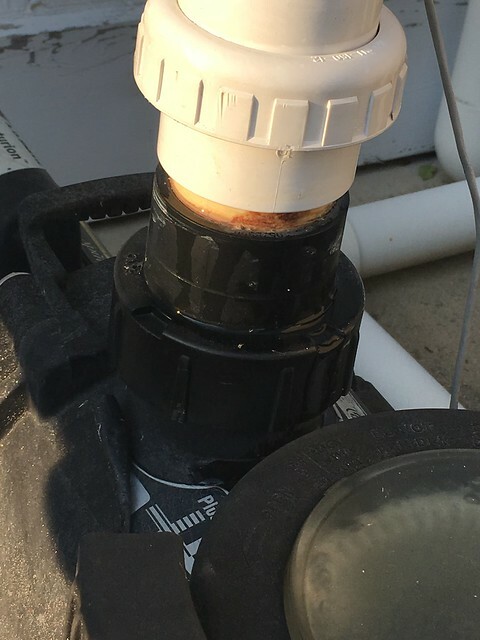 We just opened the pool, but the plumbing on the return side of our filter pump has a leak. It looks like the glue/seal between the black pipe and the white pipe has broken. I'm not necessarily a plumbing person, but my other half is comfortable doing this kind of work. Are there any special considerations or tips for repairing this leak? Looks like you have a black union fitting that attaches to the pump and then a white union fitting above that (not sure why you would need this white one). Likely you will have to find and buy a new black union that will fit the pump (this may have proprietary threads). Then you might be able to just cut out the white one completely, add some pipe and use a PVC / CPVC solvent with primer on the new black union fitting. PrairieGirl, Your signature made me chuckle! The plumbing is relatively easy the hard part is getting all the right parts at the store. The color of the union won't really matter as long as it screws on. If it is his first time trying plumbing I would suggest buying extra parts because nobody like running back for one more piece. Make sure to prime the parts before applying glue, the primer takes seconds to dry. They sell a purple primer and most places have a clear primer. Building inspectors like to see the purple primer in the house, they don't care about your pool plumbing.